Okay so I couldn’t wait for the Differentiated Assessment to be finished before sharing. STEP 1 is only one tiny baby step and I promise STEP 2 will WOW you! In STEP 1 a Google Forms is used to create the assessment. 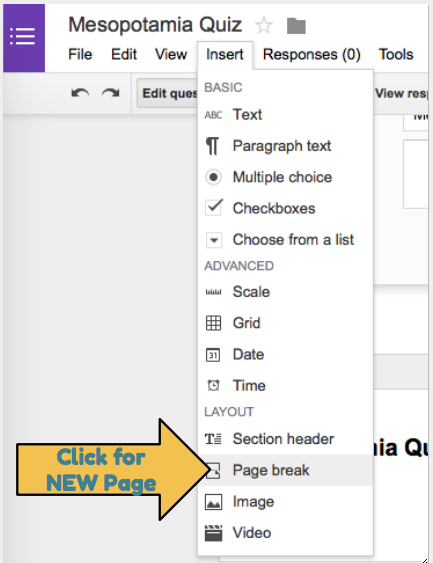 The trick used in this step is the adding of multiple Google Forms pages. This way each question appears on a page by itself. Hopefully this will lessen some anxieties towards testing. Recently I took an on-line test and found it so much easier to focus on answering the question when presented on individual pages. When multiple questions appear on a page it can be distracting. This is because it compels the test taker to read them instead of focusing on answering one question at a time. It is so much easier to focus on answering a question when it is isolated. Another beneficial modification in STEP 1 is the addition of visuals. The visuals tend to be in color making it much easier for the student to recognize the fine details. If you are successful this is what the Google Forms Assessment will look like. What Google Drawings Page Setup Should I Use for Creating Interactives?